An estimated 20 million displays are currently operating in North America’s corporate, ad-based and brand networks… some are failing, many are failing to build-out and grow to points of greater service and many could be delivering much higher value to those they intend to serve. Most problems are operational, but the seeds of failure and strife are sown in the planning stage. Plans that do not adequately contemplate communications impact and link value to investment is destined to be the runt of the digital signage project litter. Inadequate benefits planning & analytics fail to demonstrate (or predict) the return on Investment or return on objectives. Without a reason, projects cannot “earn” required budgeting – given that funding must typically be found and re-directed from other seemingly equally worthy initiatives. When planning does not consider all aspects of future operations and engage stakeholders to validate approaches and assumptions, breakdowns can, and typically do, occur. 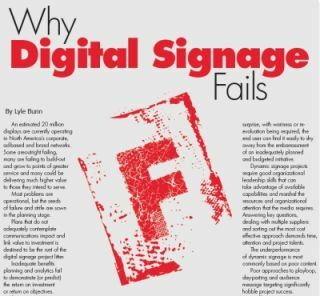 The resulting surprises in operating costs and the necessity for stop-gap and work-around approaches can place digital signage projects in the categories of nuisance or unsubstantiated investment. When additional expenses become a surprise, with wariness or re-evaluation being required, end user can find it easily to shy away from the embarrassment of an inadequately planned and budgeted initiative. Dynamic signage projects require good organizational leadership skills that can take advantage of available capabilities and marshal the resources and organizational attention that the media requires. Answering key questions, dealing with multiple suppliers and sorting out the most cost effective approach demands time, attention and project talents. The under performance of dynamic signage is most commonly based on poor “content”. Poor approaches to playloop, day-parting and audience message targeting significantly hobble project success. Insufficient message refreshment that results in content being outdated, stale or over-exposed naturally results in viewers disregarding the displays. No viewers – no value – no network… too varying degrees. The quality of content both indicates and drives the life of the network. The medium needs animation and motion in message composition to assure advantage of the medium. Presenting a loop of still images (i.e. powerpoint-type slides) under-uses the technology infrastructure and ultimately will be considered uninteresting or not worthy of viewing. Ongoing operations mean that displays are operational, content is interesting and relevant and that the symbiosis of viewership and messaging is constantly improved. Network health also intends that economies and efficiencies are constantly sought, within the context of increasing value to those who use the network. A monthly webinar series called “Network Operators Boot Camp” being provided by Digital Signage Federation, BUNN and several leading industry suppliers will focus on the ways that network operators can assure their success. The year-long series will commence on June 19th. See DigitalSignageFederation.org for more details.